We are happy to announce that we had several babies born this week. No not people in the office... but just as cute!! First, May 8th around 3 am Stephanie's wait was over. She woke up to a NEW BABY HONIE. 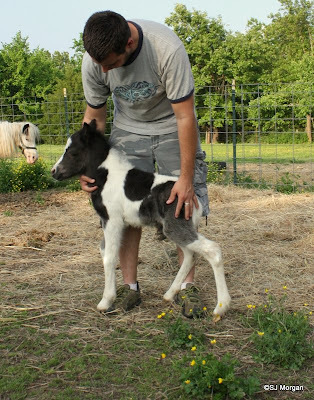 Here is Scott and the Baby Honie. She is about 18 hours old and needing a lil help. She had many visitors including a lil one. She weighed in at about 35 lbs. Dark brown and white with the cutest lil hooves. Yes I almost said "Feet"!! This is Baby D & the baby honie. You may be asking yourself "Are they standing in a GIANT NEST!?" Yes they are standing in a GIANT nest. Long story that we will save for another time. 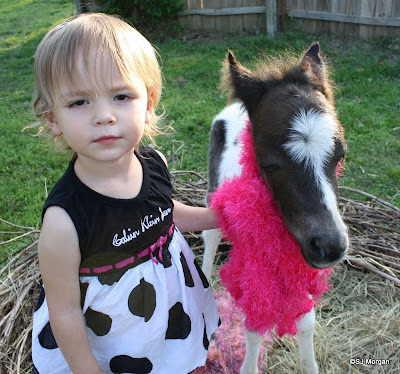 **UPDATE: I took so long posting this story that they have named the pony. I am happy to introduce Isabella or Izzy for short. Thank you for all of your suggestions well wishings. I hopefully will be able to post some video of her shortly. 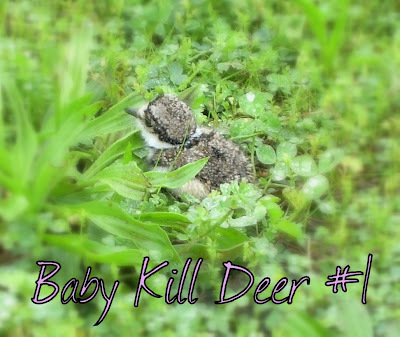 Also, the baby Killdeer hatched!! Only 1 did but he was so cute I had to get a pic of him. Sadly, he was the only one. But he was a fast lil guy. This picture was taken about an hour after he was born. Can't wait till next year to see the next brood! !